Collection of Solid Waste is provided every other week on a day specified by the Town. Green Bin and Blue Box collection are provided every week. Collectable materials shall be at the curb no earlier than 8 PM the evening before collection and no later than 7 AM on the day of collection. Refer to your Waste & Recycling Collection Calendar for your collection dates. All bags or containers set out for pick up by the waste collector must have a tag prominently displayed. If garbage is set out in a regular garbage container, please have tag secured to top bag inside container, not to the container. There is no limit to the number of Green Bins or Blue Boxes that can be placed out for collection. A maximum of five bags (one without a tag, four with tags) are allowed per garbage pick up. Collection times may vary. To ensure collection all materials must be out at the curb before 7 AM. Disposable bags, or other waste containers shall not exceed the size of: 76 cm x 122 cm (30" x 48") for bags. Refuse cans/containers are to be reusable metal or plastic, no larger than 50 cm (20") in diameter and 90 cm (36") in height and have handles and a lid. All material must be bagged and tied. Blue box maximum acceptable size is 50cm (20 inches) in height and 50cm (20 inches) in width or length. Recycling material will not be collected if placed in plastic bags, including but not limited to clear blue recycling bags. Total weight of each full can, container or bag cannot exceed 50 pounds. Seaweed (duckweed) is considered as yard waste. Please visit the Leaves, Brush, and Yard Waste web page for additional information. 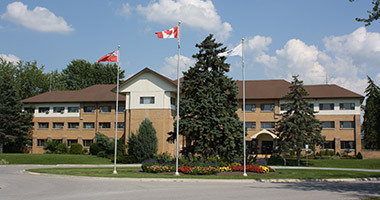 On January 6, 2003, the Town of Georgina implemented changes to the User Pay Garbage Program. Each household is permitted to have one free garbage bag or container set out for pickup by the waste contractor. Additional tags may be purchased at the following participating Bag Tag Distributors.